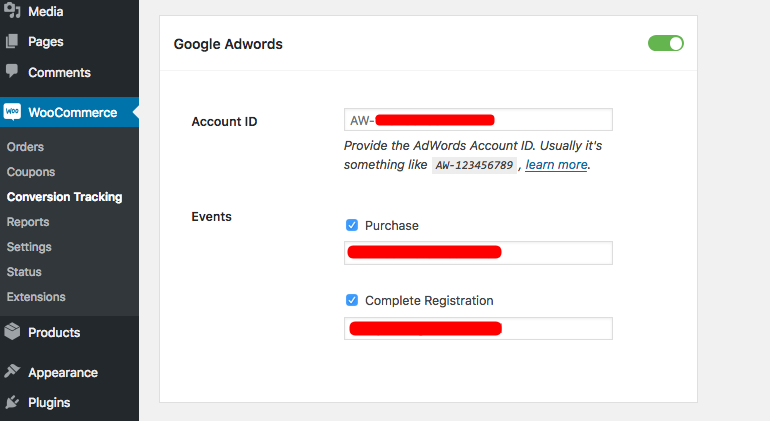 Once you get the Google AdWords Account ID, it would be just a matter of a single click to track any events that are happening within your WooCommerce website. If you couldn't get the Account ID then, read this documentation to learn how to get the ID. We assume that you have activated the ID in WooCommerce Conversion Tracking. To keep tracks of Purchase events, all you have to do is just check the “Purchase” box of WooCommerce Conversion Tracking. Then create a Purchase event in Google AdWords so that you can get a Purchase Label. Copy the unique Purchase label and paste that Label in WooCommerce Conversion Tracking. Next, hit the Save Changes button and you are good to go! How to get the Purchase Label for the Purchase event? Hit the Tools icon as indicated by the red arrow. If you do so, a mega menu will appear on the screen. Select Conversions from therein. After that, select the kind of conversion you want to track. To track sales and other actions, select the Website option. Give a Conversion name, select Purchase/Sale from the Category option. Next, check the Don't use a value radio box from the Value option. After that, click on CREATE AND CONTINUE button. You will have to copy the label (as underlined in the screenshot) and paste it into WooCommerce Conversion Tracking. This is how you can track Purchase event in Google AdWords with the help of WooCommerce Conversion Tracking. This event of WooCommerce Conversion Tracking will help you see all the data when your customers complete any registration/sign up process. To keep tracks of Complete Registration events, all you have to do is just check the “Purchase” box of WooCommerce Conversion Tracking. 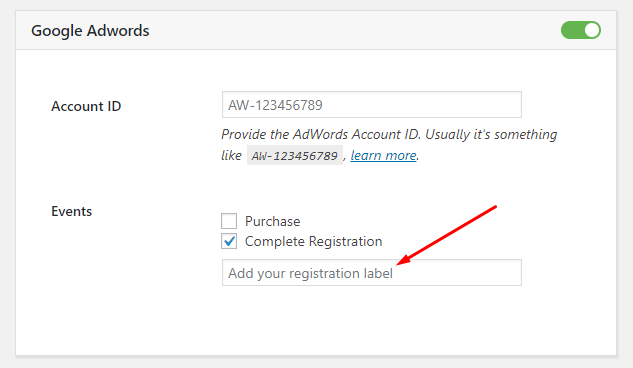 Then create a Complete Registration event in Google AdWords so that you can get a registration Label. Copy the unique Purchase label and paste that Label in WooCommerce Conversion Tracking. Next, hit the Save Changes button and you are good to go! How to get the Registration Label for the Purchase event? Give a Conversion name, select Sign-up from the Category option. Next, check the Don't use a value radio box from the Value option. After that, click on CREATE AND CONTINUE button. This is how you can track Complete Registration event in Google AdWords with the help of WooCommerce Conversion Tracking.